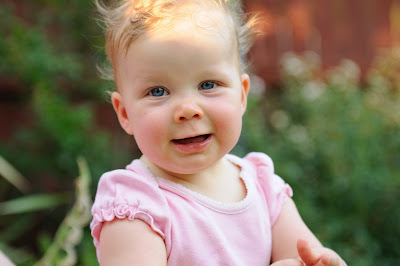 Savor The Days: Rachel is 9 months old! I'm so excited for my little girl. She is growing up so beautifully. She's happy and healthy and she brings such joy to our lives..and a little more exhaustion too. Rachel is able to hold herself up in a standing position for quite a while. However, she isn't crusing around on furniture yet. She will scoot her hands along whatever she is holding on to but she forgets to move her feet with her so she just falls. Poor baby! She is trying to pull herself up into a standing position but just isn't strong enough yet. Rachel eats mostly baby food but she loves to try to eat mushy table food. She has a good pincer grip and is able to pick up small pieces of food but somehow they often slip away between the finger to mouth transfer and most of them end up in the seat of her high chair. We're working on getting her to take a sippy cup but it's going about as well as it did when we tried to get her to take a bottle. She just chews on the spout and doesn't seem to be able to figure out how to get the liquid out. Rachel loves to grab things and shake them, especially long things like a strip of ribbon or even a particular speaker wire that she has discovered in the living room. She can fly across the room on her belly but still not crawling. Speaking of flying across the room, Rachel will play well by herself for quite a while but when she's ready for a break she quickly will belly crawl her way right over to me and pull on my clothes as she tries to climb into my lap. The other day I had her playing in the living room while I was in the kitchen washing dishes. I had not watched her for a minute or so and next thing I know she has crawled all the way into the kitchen to find me so I could pick her up. Her hair has grown a lot but it is still baby fine and wispy. I brush it several times a day and within five minutes the curls are back and going in all different directions. I try putting headbands and barrettes in her hair to contain the crazy hair but Rachel just pulls them out. Rachel loves swimming and playing in the grass (although she tries to eat any grass, leaves, or sticks that she can find). She loves her naps and is a very good sleeper. And we all love and cherish her very much.